Philippe Karl lives and trains in the south of France together with his wife Bea Borelle. He was a rider/trainer at the famous French riding school in Saumur, the Cadre Noir for 13 years and now trains horses and riders all over the world in his School of Légèreté which consists of a 3 year course with the goal to become a licences instructor. He has written and published 3 books and several DVD series showing his training philosophy and the system he has developed and keeps developing during a lifetime of training horses and riders. In his latest book "Twisted Truths of modern Dressage" he describes his principles of training Dressage in lightness and criticizes some trends of modern Dressage training as it is often seen in Dressage training nowadays and many other disciplines as well (over flexed horses, lack of true classical collection and the use of excessively tight nose bands to name a few) and presents us with solutions and training alternatives based on the writings of old dressage master, modern knowledge of anatomy and bio mechanics and years of riding and training horses and teaching riders. His classical approach does not just rely on the natural talent of the horse but shows a system to train even average and less talented horses to higher levels and to finding a good balance to become light. If you would like more information on Philippe Karl, the teachers courses and licensed instructors you can go to his website at www.Philippe-Karl.com . The Teachers Courses in the USA are now taught by Bertrand Ravoux one of only a few approved master teachers by Philippe Karl. In BC Canada we have Melanie Buhlman, another approved master teacher from Germany who is teaching us in Chase, BC and Olds Alberta. The goal is to bring out the best each individual horse has to offer, respecting each horse's physical and mental limitations, adjusting the training approach to the horse's conformation, state of relaxation and individual natural balance and conformation. To train a horse means to relax it, to bring it into a good balance and to then use gymnastic exercises to improve its flexibility, mobility and strength. The goal is to have fun with the long and rewarding journey of training a horse, creating a responsive and safe riding partner through clear communication no matter what breed or age the horse might be. We would like the horse to enjoy himself as well, grow stronger and more beautiful in his body and posture and to keep his enthusiasm and participation to work with us. The first step to lightness is to explain to the horse the aids of the hands, leg and seat. The principle here is to use ‘hands without legs and legs without hands’ to not contradict the aids and to be clear to the horse. The hand and bit aids relax the horse by stimulating and conditioning the horse to keep his mouth lively and gently chew on the bit, can change the position of the horse's head and neck to change the balance and bends and flexes the neck and poll. The legs create impulsion to a very light leg aid without having to support the horse constantly, pressure with both legs mean forward movement, pressure with one leg for lateral movements. The seat and balance of the rider support the hand and leg aids by shifting the weight from side to side and backwards and forwards to move the balance to different legs and sides of the horse with our goal being that our seat and balance will replace most of the rein and leg aids as soon as possible. The next step is to create a flexible, relaxed horse with a steady active rhythm by riding on curved lines and using inside and counter bends, mostly in the neck as the bend through the rib cage is anatomically not possible. 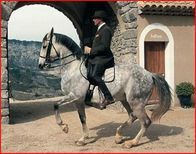 This improves the riders ability to straighten the horse and to control the balance of the shoulders. Lateral mobility, impulsion and balance are improved with lateral movements on straight and bent lines (shoulder in, travers, renvers and half pass). Longitudinal mobility improves with transitions between and within the gaits. The reaction to the leg aids becomes more refined and light and the horse stays active and ready to go forward more consistently. Collection is the ultimate reward and results from a light to the aids, flexible, balanced and mobile horse in a state of mental relaxation but full of impulsion and activity, his full attention and willingness to work with us.